Europe is getting its first Open Compute Project (OCP) experience center, courtesy of three local digital infrastructure companies. The facility is located in Amsterdam, conveniently close to the Schiphol airport, on a campus run by Switch Datacenters. It features 21-inch Open Racks made by German critical infrastructure specialist Rittal (OCP member since 2017), and servers supplied by Circle B – a startup that specializes in adopting OCP software and hardware for enterprise customers. The experience center offers an opportunity to test ‘OCP Accepted’ and ‘OCP Inspired’ products in a fully functional data center environment. The announcement was meant to coincide with the regional OCP Summit in Amsterdam. Since then, the non-profit organization has attracted more than 200 corporate-level members, including heavyweights like Microsoft, Apple, Google, HPE and Cisco. Earlier this week, electronics giant Huawei became the fifth Chinese company to join the project. It will be located on the premises of Switch Datacenters – another OCP member that specializes in cloud and colocation services in the Netherlands, and is currently building a data center based on OCP guidelines. 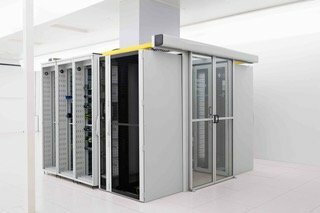 “Circle B, Rittal and Switch Datacenters have put together a great showcase for open hardware designs and it highlights the strength of each member in delivering OCP solutions throughout Europe,” said Steve Helvie, VP of Channel for the Open Compute Project Foundation. On Monday, Chinese hardware vendor Inspur launched a set of OCP-compliant hyperscale rack servers for AI research, originally designed for China’s Scorpio/ODCC open hardware project.